The importance of an artist’s sketchbook as a preliminary tool vary, but many will tell you it is the springboard to every body of work. Here, within these private pages, an artist is free to write, draw, cut, paste, and pour out anything their imagination desires. Usually, those sketches never get seen by anyone other than its creator. Artist Laurie McIntosh became so inspired by her doodles and writing that they evolved into an entire array of mixed-media works on paper and panel, deconstructed and reassembled pieces based directly on her handmade sketchbooks. 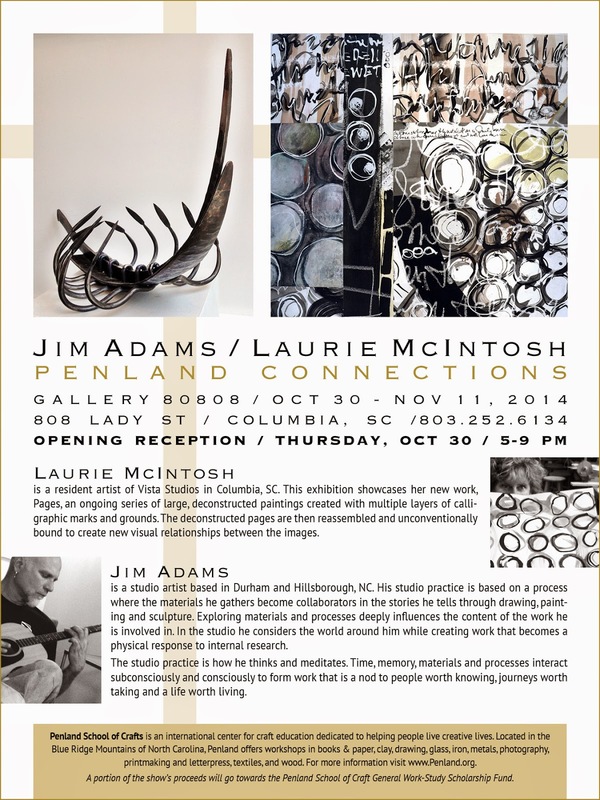 Her work dominates the Penland Connections exhibition at Gallery 80808, but is complemented by the simple yet intriguing sculptures of North Carolina metalsmith Jim Adams. 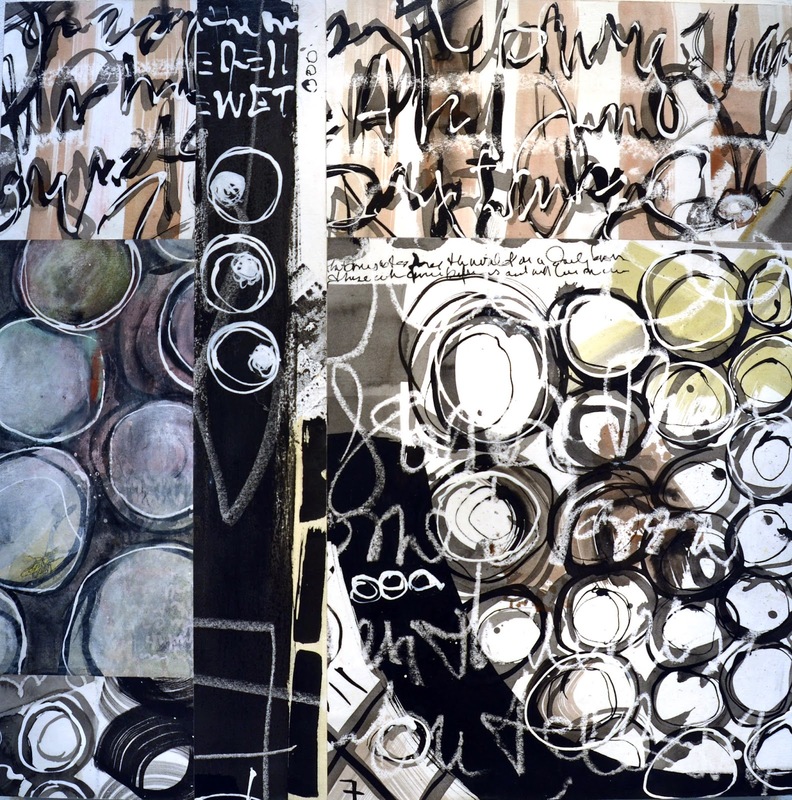 work from 2012 (“All the In Between”), which uses a similar mark-making process. The results are fresh, bold pieces that stand strongly, almost bursting off of the wall. The graphic quality to them give a slightly urban essence, with a stream of black and white used throughout, which is intermixed with highly saturated tones of blue, violet, red, and pretty much any other color you can imagine. There is an almost mesmerizing, mysterious effect to McIntosh’s mixed-media pieces – her enticing circles, frequently randomly drawn in a grid pattern; scribbled half-cursive, half-inventive line work; number sequencing; mostly unintelligible text that is both alluring and calligraphic. McIntosh takes her works one step further in her gridded spinning box pieces, which are interactive, like her piece titled 2 of 3 Whirling Pages/3-D. They almost beg to be played with, like an adult version of an interactive toddler’s learning toy, where you try to spin and match images or lines. Looking for more things to do in Columbia SC? Visit free-times.com/events.Standing eloquent and tall among McIntosh’s pieces are Jim Adams’ sculptures, which are brilliant and highly crafted pieces in hand-forged and fabricated steel, iron, hand-carved limestone, wood, and found objects. Reminiscent in spirit to the mixed-media works on the walls by McIntosh, Adams’ pieces have fleeting line worked copper, small dangling metal houses, and even a playful wooden swing in others. In the main gallery space, the piece Sentinal seems to have a direct connection with McIntosh’s paintings. A drawn metal wiry line creates a gestural circle within another circle, standing above various stone pillars; the compositional similarity is uncanny, even though the artists did not actually collaborate or make their works together. This similarity between the two was discovered during their residency at Penland last year. McIntosh is a frequent visitor to Penland School of Crafts, located in the mountains of North Carolina, finding immeasurable inspiration from the environment and fellow artists. During her last winter residency at Penland, she forged a friendship with North Carolina artist Jim Adams, who was also doing a residency. Their work might be of two very different materials and subject matter, but somehow work together in an effortless sort of harmony. 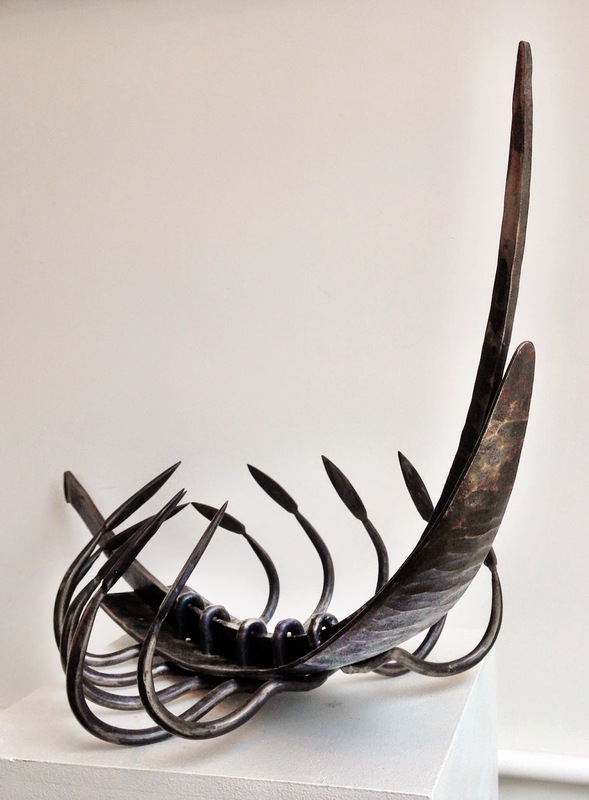 Working mostly with metal, wood, and found objects, Adams is based out of North Carolina, with a fairly established following in the Durham and Hillsborough communities. McIntosh, a graphic designer and business owner by day, is a resident artist at Gallery 80808/Vista Studios and now a household name in the Columbia art scene. Her 2012 series, All the in Between: My Story of Agnes, brought strong support and interest, which resulted in a published book and now plans for an original play to be debuted at Trustus Theatre next year. It is currently on display at Richland Library’s main branch.